Today Shaun Hunter’s Writing the City blog series features my first novel, Love Minus Zero, with a brief excerpt and a really nasty picture of the National Hotel. Thanks for the shout out, Shaun! I’ve been enjoying the series very much. Tune in to read about Calgary through the eyes of writers. 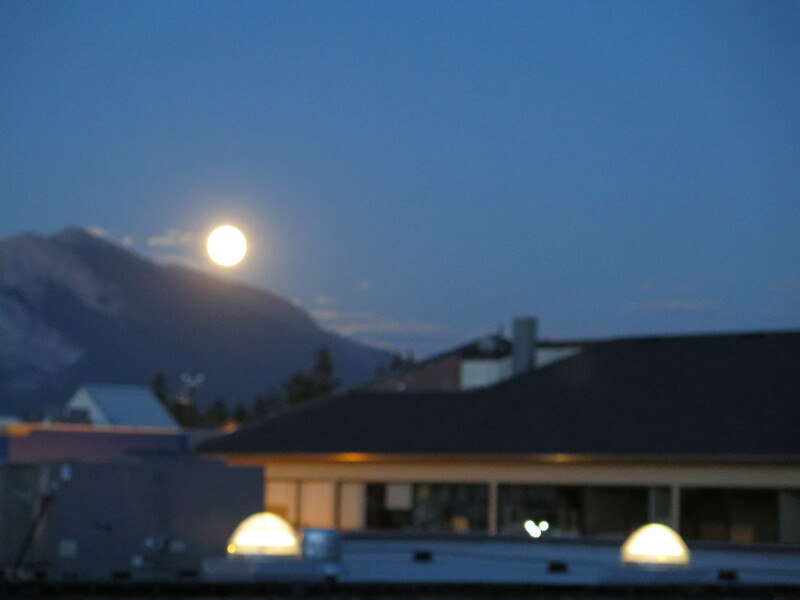 There’s the full moon coming up over the mountain in Canmore on Thursday night. My friend Jan Markley and I were there for a truly self-directed writing retreat over the weekend, and I must say we both truly got a lot of work done. I can now see the light at the end of this first draft of a new novel I’m working on. We also enjoyed getting out of town and enjoying some of Canmore’s dining spots. Most worthwhile trip! In other good news, my friend Lee Kvern is going to be Calgary Public Library’s author-in-residence this fall! Check out the info here. Congrats, Lee!